Following on from the first post where the voltage was dropping when the motors were under load causing the arduino to reset i tried a couple of things to get around the problem, first i added another cap across the arduino supply and then i added another battery in series (to give 6V total) but still the voltage was dropping too much. As i knew running an arduino from 4.5V was on the low side i went looking for a dc-dc boost to up the voltage to something more useful. What i found was a module used for charging USB devices from voltages down as far as 3V. These are rated at 700mA so more than enough for what we’re running off them. The actual output voltage is 5.5V which is in the acceptable range for the arduino. With the Dublin Mini Maker Faire just around the corner i treated myself to a new toy to hack in its honour, yeah i know, any excuse. Everytime i look at my 1:18 scale delta integrale (a reminder of the one i used to own thats sorely missed!) i always think that it would make a great project to add working lights to it and have them controllable. Then i remember how much the model cost and i decide not to chop it up, not yet anyway. 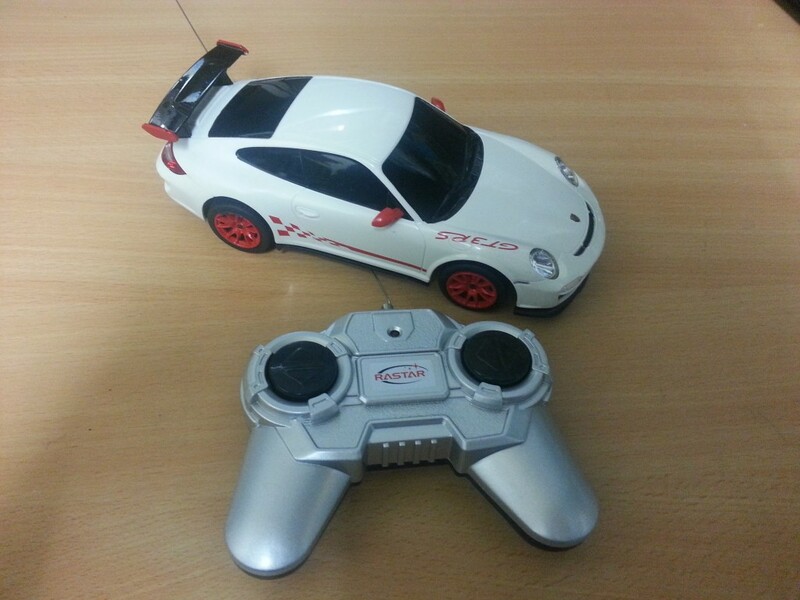 As i was browsing the argos site to look for anything interesting and cheap i came across this Porsche 911 GT3 RS which seemed like a nice buy. Our TV is controllable over wifi from an android app and this has proved very useful as i’m rarely seen without my phone either in my hand or at least in my pocket. The TV remote (a Harmony One universal) has a habit of hiding down the side of the couch and generally going missing. The number one use for the TV is with the Sky HD satellite box and not being able to control it from the phone was definitely inconvenient (#firstworldproblems) and it’s something i wanted to remedy for quite a while and its something i started looking at a while back. The plan was to take a bluetooth serial module and connect it to an arduino of some description which blasted the codes via an IR LED. The bluetooth module would take commands from an Android app. 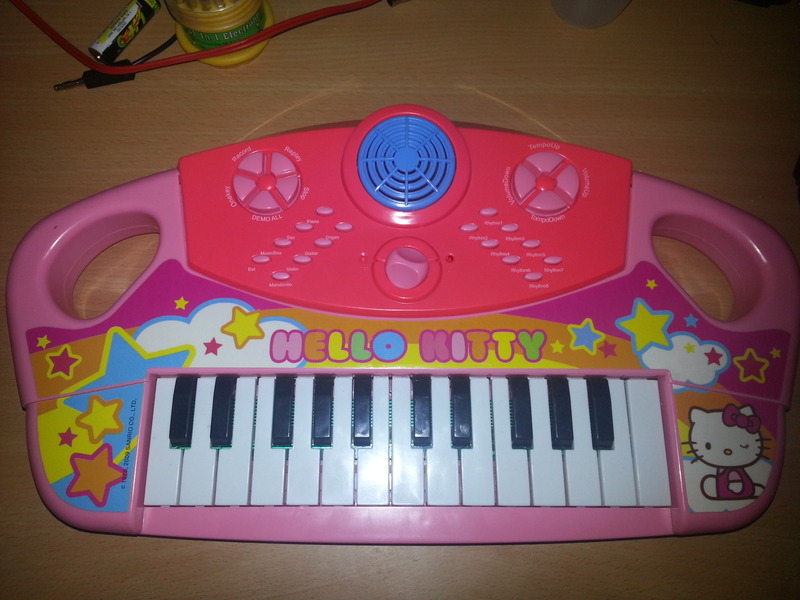 Megan has a Hello Kitty keyboard that she got for christmas last year, it was a cheapy stocking filler but she loves it. The problem with it is that its very loud and when its first turned on its automatically set to near max volume – not the greatest thing for mammy and daddy at 7am!